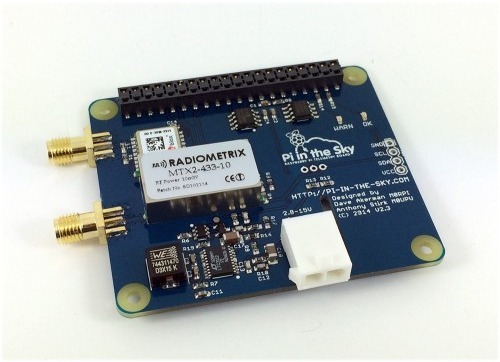 Pi In the Sky is a simple and reliable GPS radio tracker board for the Pi. This board is a GPS receiver and radio transmitter designed for tracking high altitude balloon flights. It uses a UHF radio transmitter which is license-free in Europe (for other areas check your local regulations). To track the location of flight you also need a radio receiver, aerial and PC on the ground. Suitable radios include TV dongles - see http://ukhas.org.uk/guides:sdr_tracker for examples of suitable models and full instructions. We now have a new board which is smaller and lighter, and includes 2 radio transmitters (RTTY and LoRa). This is sold complete with a Pi Zero and pre-programmed SD card. Together with the supplied, open-source software these boards embody the experience of 70 successful flights, over half of which have used the Raspberry Pi. These boards have also been used on all the Raspberry Pi Skycademy flights, and many more customer flights. For support, see our support pages or read the new manual. We do now support the Pi B V3 (see updated instructions / manual). We still recommend an A+ for flight however (lower power consumption and less weight).